It’s a word I’ve thought about a lot recently — as this Presidential election heats up, candidates vying for the ultimate position of power and voters finding themselves in close proximity to power. “The Power Vote” has propelled Donald Trump to his frontrunner status, as explained by a recent episode of This American Life. Success equates to power, and after all, isn’t that what all of us are after in some respect? 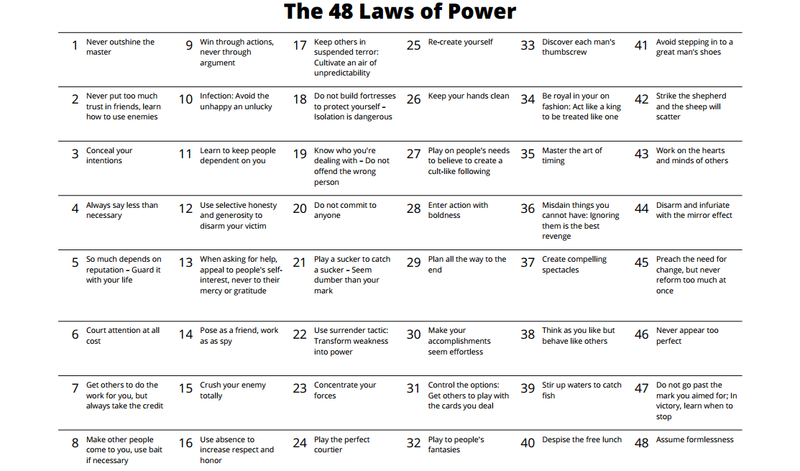 Someone I deeply respected told me after one of our coffee dates to pick the book, “48 Laws of Power.” Words to live by, he said. As a 25-year-old stuck stagnant in her career, I immediately left the Midtown East coffee shop and went downtown to the Strand Bookstore to pick up my magical book of Power. I went home and devoured the book. Most of it was long and boring (I’d been warned of that). But I wanted to find success in the field of journalism, and the person who told me to get the book was at the top of the field — so, surely these pages held the key. I passed on the wisdom of this novel to another colleague at work, who took its laws to heart. He’s currently killing it as a reporter/photog in Miami. What I didn’t realize was that I wasn’t taking the book’s laws of power to heart — no, I was answering to a different law of power. The power of the person who told me to get the book. In the work place — proximity to power is intoxicating. It makes you feel smarter. It makes you believe you can achieve anything. It leaves you starry-eyed and optimistic. And you’ll do anything to keep that feeling. I guess that brings me back to this election season, or even the one in 2008. When I first felt this genuine proximity to Power — working on the Hill in Washington, D.C. When you are that close to Power, you start to feel it in yourself (even if you’re the intern fetching coffee). We all want to feel like we’re capable of success and building opportunities for ourselves. That we're so confident and have the ability to carve our own paths. And some people have. And I admire them. I took the easy path to Power. Or so I thought. Turns out the easy path leads to a dead end. Being close to Power creates a false illusion. I didn’t listen to Law 29. I didn’t plan to the end. Instead, I basked in the moment, relished in the power, and expected because I was close to power, I would be able to find it in myself. Now that I’m at the end, with no more ties to this person I considered as my source of Power — I’m actually re-reading “The Laws.” And I’m realizing how I dismissed and failed to listen to the majority of them. Perhaps, that’s why, right now, in most facets of my life — I feel powerless. But here’s the great thing about Power. You can always get it back. It doesn’t take a day, or a week, or even a year. It takes time, it takes respecting yourself, and it takes that really tough moment where you need to step back and realize that being close to Power does not equate to Power. You need to find it for yourself.